Oh boy, did I go into this with high expectations! Especially after the excellent first two seasons of The Walking Dead impressed with an engaging narrative and deep, relatable characters. The Walking Dead: Michonne feels like a cheap cash-in, a way to whet the appetites of fans while they await the more-than-likely release of Season 3. Related reading: Nick's review of the first episode of the second series of The Walking Dead series. 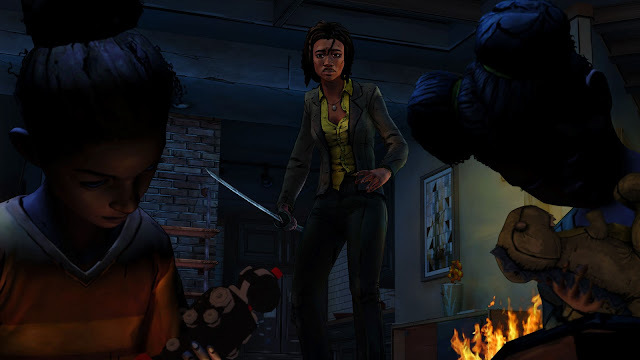 The Walking Dead: Michonne is obviously focussed on the titular character, and is a part of the visual novel canon during the period that Michonne leaves Rick’s group (and her katana, boo!) to deal with some inner demons. Michonne’s struggles with her past form the most engaging part of the narrative, with hallucinations of the ghosts of her past and the struggle she has over whether or not to just end it all herself make Michonne one of the most human characters in the Walking Dead universe. What is unfortunate about the narrative of In Too Deep (the title of episode 1) is that it is over before it begins, even shorter than a usual episode of a Telltale game. Normally this wouldn’t be a big deal, the length of a game shouldn’t matter, except the shortness of this episode has impacted too much on the narrative and put the pacing of the game way off. During my playthrough, it honestly felt like it was half “press X to kill zombie” and half story progression, which totalled an hour and twenty minutes. I do get that Telltale are aiming to focus only on Michonne’s journey, but that just highlights another problem. Every other character in The Walking Dead: Michonne thus far is an incredibly boring one-dimensional character. From your standard “let’s save everybody!” character, to an almost identical character to The Governor from the TV show (without an interesting backstory), to a character that leaves everyone scratching their heads as to how they’ve survived a zombie apocalypse for so long. I do understand that this is merely episode one, and as such character development may come into play in future episodes, but there is only two episodes to come in this mini-series, so there isn’t exactly much room to improve these characters supporting Michonne, especially if they are as short as this episode. On the gameplay side of things, quicktime events are what you’d always expect from a Telltale game, merely there to keep the story going and to keep the player engaged. I do enjoy these quicktime events in story driven games such as these and the recently rereleased David Cage games, as I find keeping me involved keeps my attention focussed on the plot, as opposed to watching a Blu-ray where I find myself checking my phone for emails, cooking dinner or some other house chore that I can do while the show plays in the background. In saying that, there’s no shortage of quicktime events here, so Michonne always has something to do. 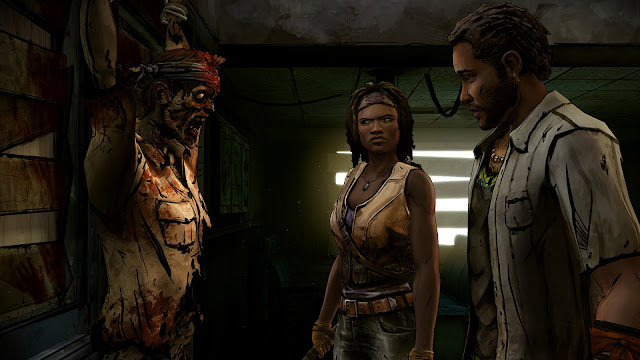 When not engaging in smacking a button to keep on going, Michonne finds herself having to have discussions with the aforementioned one-dimensional characters and make choices based on how the player feels Michonne should respond. These conversation trees apparently alter how others feel about Michonne and adjust their dialogue appropriately, but as is the case with other Telltale games, actual changes seem to be pretty minimal in practice, with only the serious choices that show up on the end of game stats having an actual impact in the story. The game will say “he will remember that” when Michonne says a certain thing, but it’s never brought up again, so in reality it doesn’t matter so much in the bigger picture. Time will tell if there are bigger impacts from these decisions across the later two episodes. And this is a problem I have with these new styles of point and clicks by Telltale in general; they boast about how they put the player in control of the direction of the story. In reality, however, most of these choices are merely useless in the grand-scheme of things. The times where I needed to make a heart breaking decision in a game where I save the life of one and let the other die, only to realise that they’d both be dead by the end of the next episode, or a time where I let somebody stay in my group, only for them to leave ten minutes later of their own accord ensures that the game's directors remains in control at all times. Don’t get me wrong, most recent Telltale games are absolutely amazing in their ability to weave an engaging story, and I do get that it would take additional time and resources to keep the decision trees intact for the duration of the season (and carry over to the next season if possible), but I do think it is a risk worth taking to let those decisions carry more weight and for longer. The challenge in Walking Dead: Michonne is non-existent. It’s hard to ignore, considering the other Walking Dead titles have had moments where you do need to work to progress. I do hope that the following episodes contain a bit more use of Michonne’s grey matter, as she’s simply more than a zombie-killing machine, and fans of Michonne know that. One last thing before I conclude this review, is that I think it is interesting that Telltale are once again allowed to produce story that takes place in the Walking Dead visual novel canon. The first season was original, and showed Glenn and Hershel before they appeared in the visual novels, but that has since been revoked and made its own version of the Walking Dead without much of an explanation. 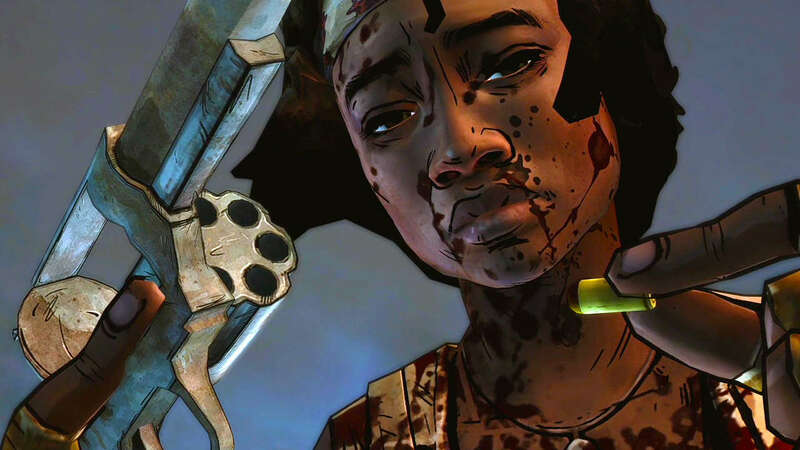 So in a nutshell, what happens in Walking Dead: Michonne, takes place in the comic books, but does not take place in the same universe as Telltale’s other Walking Dead games. Confusing, isn’t it? Related reading: And for a different take on The Walking Dead franchise, check out what happens when The Escapists go Walking Dead. 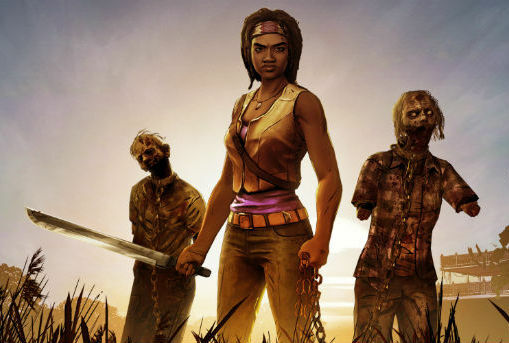 I feel like I’m being very harsh on The Walking Dead: Michonne, but that’s only because I’ve been such a fan of Telltale games over the years, and this doesn't meet my expectations of the team. I do want to know more about Michonne’s backstory, I just wish she was working it out with more engaging characters.